Now a days the most advance solar charge controller are Maximum Power Point Tracking (MPPT). These controllers are more expensive than the PWM charge controllers, but it has several advantages in compare to. The MPPT charge controllers are used for extracting the maximum available power from solar panels for charging battery under certain conditions. Of corse, you can buy one because to build one require some basic knowledge of electronics. MPPT circuit is based around a synchronous buck converter circuit. I shall not insist upon it. There are lot of knowledge on this site. A good job was made by Julian Ilett, who put a lot of youtube tutorials waiting for you. I thanks to all of them for sharing their knowledge. The first one is Tim Nolan who initiated this adventure. And I think you will not be the last who will try. Now I can not tell you “Abandon all hope, ye who enter here.” but will not be so easy and you may try that just one more time in your life. All of these enthusiasts was inspired me to build one, and finish this project. The waveforms are for 5V/div amplitude and 5 us/div timebase. 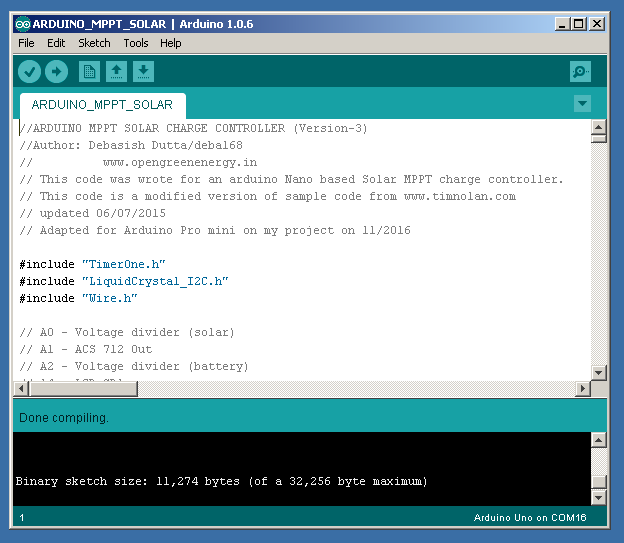 // This code was wrote for an arduino Nano based Solar MPPT charge controller. A good solution for those who need Half-Bridge IR2104 can follow this link. I have come back to this post due to the large number of requests from passionate people wanting to let you know another article published by Debasish Dutta, after a hard work that we each bring little contribution to. And here repositories with contribution of Adam Plavinsto to this project:Please read carefully the coments of Keith Hungerford to this project. I tested this code in Proteus. The code perfect matches on the existing hardware. The result is a positive one. You can use or not facilities offered by ESP8266. And I must say once again that we are grateful to Tim Nolan. Felicitari pentru finalizarea acestui proiect abandonat pe nedrept. Interesanta ideea cu cei 18V pentru IR2104 obtinuti din convertorul boost MC34063 dar nu vad si ceva detalii constructive. Presupun ca nu se mai ard mosfeti asa ca in vesiunile de baza. Ducerea la bun sfarsit a acestui proiect a reprezentat o provocare pe care mi-am asumat-o investind ceva timp pentru studiu si munca, dar care mi-a adus si satisfactie. Am inceput prin a face abstractie de faptul ca un astfel de charger poate fi cumparat, lucru facut de altfel de toti cei carora le-am citit experientele si am incheiat prin a il pune in functiune. Nu am avut probleme cu MOS FET-ii acestia fiind protejati la curentul invers venit dinspre bateria de acumulatori. Am folosit cele doua convertoare de 5V si respectiv de 18V in considerand ca au un randament bun si reprezinta o solutie moderna pentru astfel de situatii. In ce priveste detaliile constructive, am considerat ca acestea nu se impun. Dincolo de schema electrica de principiu fiecare este liber sa isi foloseasca cunostintele si indemanarea, realizand astfel, poate un proiect mai bun ca acesta. Daca este totusi ceva de lamurit, o voi face cu multa placere. Iti multumesc mult pentru aprecieri. How did you connected the MC34063 (which pin goes where)? With IC type MC34063 was made two converters, how can you see in image (I made some changes for better understanding). One is step down converter 12V->5V, and the other one is an step up converter 12V->18V. Shematic diagrams for this one can be found anywhere on Internet. Hello Sir, nice project. Do you made pcb layout of this project? I`m sorry, but for this project I used some pieces of perfboard, where I soldered electronic components, like you can see in the picture attached. Only four module was independent bought: Arduino PRO mini, LCD display, I2C shield for display and ACS712 sensor. All that independent modules was than connected toghether with wires. Of corse there is no problem to create one. Thank you for the interest and apreciation. 1. Make a change in the program lines from 48 to 54 entering the new values. 2. Link two or three solar panels in series to provide enough battery voltage. 3. There must be changes in the construction of the two MC34063 converters, both in the step-down configuration to work with the new input values. 4. Change the values of the voltage divider R10 and R11 according to the purpose you want. This device is powered by a 50 W solar panel. It probably does not meet the requirements of an industrial one but fulfills its purpose. And is the result of over three months of study and experiments. Being an open source everyone can make their contribution to being improved. My main contribution consisted of using the 5V and 18V converters. thank you for your immediate reply sir , actually am doing my final year project on MPPT BASED SOLAR CHARGE CONTROLLER, I tried so many procedures but still now I didn’t get proper output, sir, I’m doing this individually so am facing some issues now I’m going to try your circuit and your code , actually i tried Debesh Dutta project only recently in his instructable he mentioned that his project is working and done by ASMLEKTOR like that so i’ll try your circuit and code and I need your contact sir please if I have any issue then I can contact you . Thank you. I’m trying to implement your project. The links to the webpages in this article, provide enough theoretical and practical technical data to start this project. It’s not a very simple one, being a technical challenge for those passionate. I will give you any building details you will need if they do. I want to design mppt for 20W 12V panel.Could you please tell me what are the changes i need to make? Solar panels can be wired in series or in parallel to increase voltage or current respectively. The rated terminal voltage of a 12 Volt solar panel is usually around 18.0 Volts, as high as 20 volts Volts in bright sunlightand and this voltage is reduced to around 13 Volts as required for battery charging. The equipment presented here meets the required conditions without modifications. I think you have to tell me more about the problem. Typically, compilation problems occur due to the lack of a proper library. see the links added to the text. How are you? i’m trying to implement this project on Proteus. But i can’t find many of the component from your schematic design in Proteus. Can you please tell me, which software did you use for designing the schematic? This time, I did not use Proteus for testing. I worked on independent modules, based on my own experience and then I interconnected them. As I said I used some ready built modules, like ACS712 Current Sensor or IIC/I2C Serial Interface Adapter Module for 1602 LCD Display, and others like step up , step down converters, I made it myself. What is the value of resistor(22E) going to irf520? Can I replace both IN5819 and MBR1560 with MBR2045CTI or can you recommend another alternative sir? Resistor value 22E is just 22 Ohms. Dioded are SCHOTTKY BARRIER RECTIFIER type. You can replace these components with similar ones. First one (1N 5819) is for 1.5 Ampers, but MBR 2045 is designed for 15 Ampers and must be placed on the heat sink with isolators. Please see image. Ah sorry, F1 and F2 are electrical fuse for overcurrent circuit protection. F1 value: 3,15A and F2 value: 5A. Thank you. Lithium-ion batteries require special precautions. A battery is made by connecting several elements in series, each having a maximum voltage admitted on them of 3.7 volts. Exceeding this voltage leads to destruction or worse, to the explosion of the battery. To avoid overvoltage as a precaution for this charging circuit requires voltage control on each of the elements, also a continuous control of the temperature of each element during charging and a rigorous monitoring of the charging current. Moreover, a solar installation can not provide a constant current load due to variations in solar intensity throughout the day. As for the use of the ACS 758, in the product datasheet, in the Selection Guide section you can see that each model has a different SensitivitySens Type. (mV / A). The parameter that requires changing in program is contained in program line number 33. What type of inductors have you used? are all of them toroidal? As you can see in the picture, I used ready-made coils recovered from different equipments, with the required inductance and the section of the current proportional to the current flowing through it. Of course you can choose any type of coil that meets these requirements. Sir, What is the purpose of separate step-up and step-down converters? First one: 12V to 18 Volts is for the proper operation of the circuit IR2104 IC only. The second 12V to 5 Volts is for microcontroller and for the rest of the circuits. What kind of MPPT Algorithm did you use sir? This one it uses the perturb & observe (P&O) algorithm. This requires very little electrical hardware to implement and can provide acceptable power increases with little cost. And as you know, lead-acid batteries allow wide charging limits. Did the circuit can handle a 200Watts Solar Panel sir? If we do some quick calculations for 200 watts, a charging current of about 16.6 Amps is required. – Continuous Drain Current: 9.2 Amps at 25 °C or 6.5 Amps at 100 °C. So he can not. This was an working experiment and use a relatively small solar panel. For higher power you can choose more power MOSFETs but this involves new experiments. Can i change the Step Up Converter & Step Down Converter to a Buck Converter & Boost Converter sir? Thank you! 12V to 5 Volts for microcontroller and another 12V to 18 Volts for IR2104 IC. You can use two modules buck-boost converter with these recommended output voltage. Sir will you please upload a PCB layout for your project that will be very helpful for me as i was trying to build the PCB layout but was unable to do so. I am sorry. I can not help you. I did not use PCB for this project. The circuit was quickly made on a perfboard and so remained. But I can tell you as I have previously answered, some modules I have bought them ready-made and others I have prepared them alone. It was only necessary to interconnect them according to the electrical diagram. Perhaps one day I will return to give a professional look to the installation. Sir any Alternative for MBR 1560 diode? 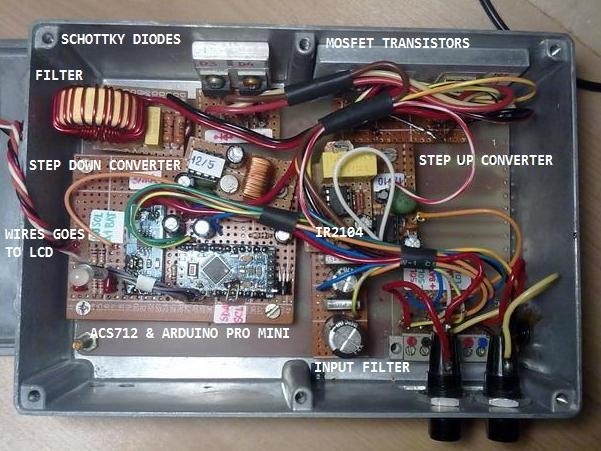 MBR1535CT is a dual common-cathode Schottky rectifier with a maximum repetitive peak reverse voltage 35 V and a maximum average forward rectified current 15 A.
I really like your project. I’m also starting to make this device. But my solar panel is 250w and 24v. Batteries are connected in series 2x12v = 24v. It is therefore essential to change the values of the resistors R1, R2, R7 and R8 and in the 48-54 line change program. Also, I assume that L3, D6 and D7 must withstand at least 10A currents. Do you agree? I’m looking for a longer MPPT solar powered charger, but they’re all 12v. Yes it is essential to make all these changes (values of the resistors R1, R2, R7 and R8 and in the 48-54 lines) because they provide continuous information to the microcontroller that takes decisions about how to charge the batteries. And of course L3 D6 and D7 it also has to meet such features. You said the features of your solar panel: 250 W and 24V, so about 10.41A on a 2.3 Ohm Load. Train to be careful that these are maximal!! The panel provides an electrical power depending on the solar power. Below 24V output voltage, the panel no longer provides enough courent for battery charging. You must measure yourself the voltage of the panel exposed to strong sunlight but you probably already know these things. See you. A0, A1, A2, A4 and A5 goes to Analog Arduino Pins A0, A1, A2, A4 and A5. D5, D8, D9, D11, D12 and D13 goes to Digital Arduino Pins. +5V from step down converter goes to cathode of LED indicators, pin 8 AC712, Arduino and I2C LCD Adapter. +18V goes to power IR2104 on pin 1. GND is general Ground for all. Can you please tell me the alternative for MBR1560CT? As I said before you can use any Schottky diodes (with peak reverse voltage 35-40 V and a maximum average forward rectified current 10-15A.) you can find. I’m working under this now. Could you please tell me the algorithm used in this? Is it based on P and O method? I need to implement P and O method. Please do tell me the changes I need to make for a P and O algorithm. What type of coil core must be? Can it be an iron core? We always use (Epoxy Coated) Ferrite Toroid Core at medium or large working frequencies. Thanks for asking. This device it is the heart of the project.. If I had not found it, I was not building the charger. As you know the IR2104 / IR21044 are high voltage, high speed and power MOSFET and IGBT drivers. You can try IR2101(S) or IR2102. The DGD2103 and DGD2104 is another IC capable of driving 600V MOSFET / IGBTs and have been designed to be a pin to pin, functionally compatible, drop in replacements to the IRS2103 and IRS2104 respectively, but with a small change of BOM to best match the gate drivers’ response. I very enjoy this project. I have a problem with code. I loaded the code as above but the LCD does not work. LCD flashes continuously. Can you help me? During the test, I found my error and fixed it. It has worked. okay, I’m glad to hear that. Hello! Very nice design and you explained everything splendidly. I was wondering why there is a buck converter after the PWM signal and before the load/battery, the diode-inductor-capacitor combo. Is this to convert the AC signal from the MOSFETs back to DC? But why have you used a buck converter specifically and not a buck/boost or boost? 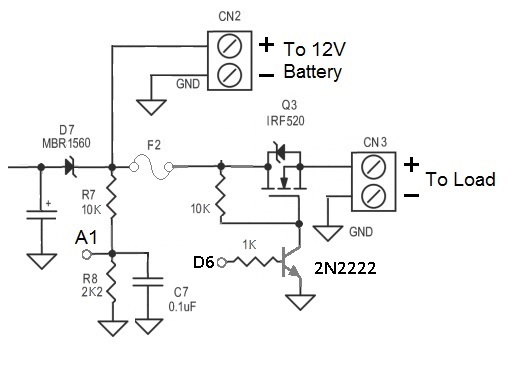 – As shown in the diagram the IR2104 IC is powered by 18 Volts DC. Step-up converter provides the required voltage for an output voltage at VLO pin in range from 0 to 20V and a VHO pin from Vs to VB. These values of the IR2104 output voltage ensure operation in the nominal parameters of the transistors IRF520. – At the output of the transistors that are connected to the battery, it can be approximated to be 12 V direct current with a possible small ripple. Thanks for the feedback and hope that these new explanations are welcome. So this panel has a higher voltage than the panels that are intended to work with 12V batteries. I’m wondering if this panel can be plugged into your MPPT charging controller for a 12V 220Ah battery?? Will the MPPT controller successfully convert and use the 250W provided by the panel? Of course, you might need to change the value of the R1 and R2 resistors that measure the input voltage from the panel. What is the maximum input voltage for the MPPT controller? I thank you in advance for the answer and answers to the previous questions. – You do not have to worry about the maximum value of the solar panel output voltage. That means you can charge the battery with a maximum current of 8A / h, and to get to the battery capacity of 220Ah you have to wait a number of maximum 27.5 hours, if the battery is fully discharged. Yes, but with mppt regulator, the input power must be equal to the output power. That is, the multiplier of the current and voltage at the input must be equal to the multiplicity of current and voltage at the output. In this case, if the panel gives 250w (8.14 A * 30.8 V = 250.712 W) and is connected to a 12V battery, the current at the output of the mppt regulator should be increased because the charge voltage is reduced to 13.8V. The output current from the controller should be 250.712W / 13.8V = 18.16A. If the output current from the Mppt controller remains at 8.14A, the charging power is 8.14A * 13.8V = 112.33W. If the battery is 24V and connected to the same panel charging current should be 250.712W / 27.6V = 9.08A. I have thus understood the principle of mppt regulator. Maybe I’m wrong. I think I understand the confusion. MPPT feature enables the input power of an MPPT controller to be equal to its output power, but MPPT controllers are not about power balancing, but power maximization. If the solar module’s Vmpp is greater than the battery voltage, it follows that the battery current must be proportionally greater than the solar input current so that input and output power are balanced. The greater the difference between the maximum power voltage and battery voltage, the greater the current boost. Current boost can be substantial in systems where the solar array is of a higher nominal voltage than the battery. MPPT typically increases the current to the battery by approximately 25% to 30%. Therefore, if the output voltage of the solar array (24V, 48V or more) is higher than the battery voltage (12V), an MPPT controller brings it down to 12V but compensates the “drop” by increasing the current, so that the power remains the same. OK, in traditional controllers (let say PWM), where the solar module is connect “directly” to the battery requires that the solar module operate in a voltage range that is below the module’s Vmpp. MPPT technology will always operate at the Vmpp resulting in less wasted energy compared to PWM controllers. Okay. Thanks for the extensive explanation because it was not clear to me. But probably it would be better if I put my 24V batteries on my panels because the usability would be greater than with 12V batteries. I suppose the MPPT controller if it is connected to a 12V battery, it can not so much increase the current due to voltage reduction to keep the same power at the entrance to the MPPT. You agree? Sorry about the issues, but I want to inform all because I’m moving into MPPT controller making. Also, I have a problem with toroid coil. Nowhere to buy such coils. There are, but for small currents (up to 3A) or they are terribly expensive. Where do you buy it? Or are you making them yourself? All other components are on the Internet (ebay, aliexpress). Is there a good toroid core from the power supply? So they just swing with the appropriate wire with a certain number of bends? I agree with you that the use of two series-mounted batteries is a good solution for both the panel and the power reserve you can use for the 24 Vcc to 230 Vac converter, for your home appliances. The ferrite core is from a the output filter coil from a switched-mode power supply, recovered from an old PC. For more current you can winding with two or three copper wire simultaneously. I am convinced that by working on such a project you will find better solutions than the ones I have applied here. Keep in touch. No, this charger is not usefull for a 18650 charging, because Li-ion battery cannot accept overcharge. Li-ion accept typically charge to 4.20V/cell with tolerance of +/–50mV/cell. To charge these batteries, special measures are taken regarding the charge current and temperature controll of the battery. Safety of lithium-based batteries has attracted much media attention. The electrolyte consists of lithium salt is highly flammable. You must use chargers designed specifically for those type of batteries. sir i am trying to simulate your circuit on Proteus and getting these errors..
if your have simulation of this circuit kindly attach here…. I can not tell you anything about the Proteus simulator because I did not use it to simulate and design the circuit. For those interested I will do the simulation in Proteus and I will communicate the results. Thank you. i will be waiting for proteus simulation …. hey im currently working on a project like this, what is the tracking method used? P&O? and which lines of codes is the tracking method implemented? If you read the code, you can see that the author used the Perturb & Observe (P&O) algorithm algorithm here . 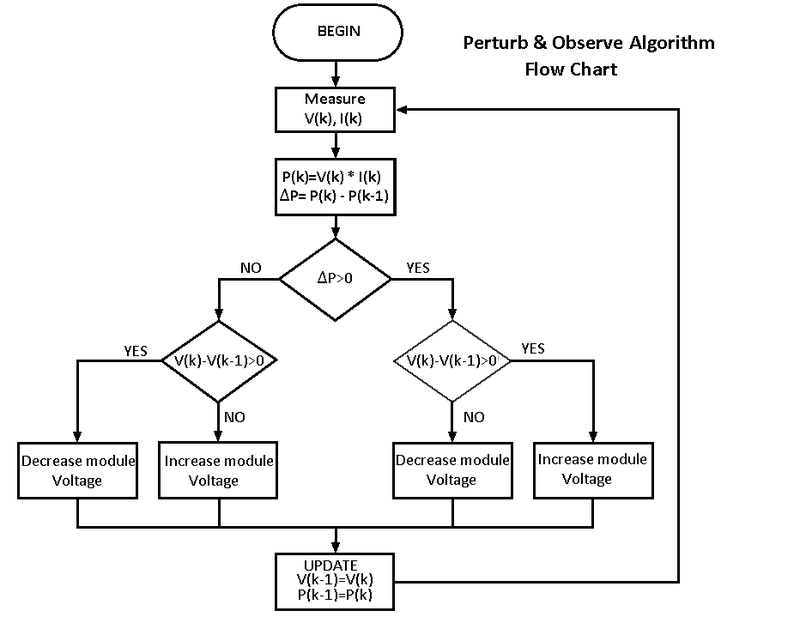 In a few words, in this algorithm, PhotoVoltaic (PV) output power is perturbed by a small increment resulting a change of power P. Please see Photovoltaic I-V power curves diagram. If the power is positive that means is has moved operating point closer to MPPT. If P is negative, the operating point has moved avay from MPPT and the direction of perturbation should be reversed to move back toward MPPT. Please see the flowchart new added to my article. Code lines where the algorithm is implemented start from the line number 224 to line 317.
he claims that mosfet q3 is burning out when he connects the battery, what was causing mosfet q3 to burn out? and what specifically you did to rectify this problem? was it a hardware problem? or a problem in the source code? Arduino Nano it is a good replacement It comes with an Atmega328P at operating voltage of 5V and with a flash memory of 32KB. The analog pins come with a total resolution of 10bits and a crystal oscillator of frequency 16 MHz. The real help is the mini USB jack for programming and tests. And yes, no changes are required in the source code. I very enjoy this project. I am making the same ones. Could you give me complete schematics please? The published material contains everything you need to build this project. I did not mount on the printed circuit but the schematic diagram is complete and fully functional. The project is one that requires a lot of knowledge and expertise. Thank you. Hey sir im thinking about adding a current sensor at the output of the buck converter circuit to show the increase in current which would be displayed on the lcd display, the reason being to demonstrate the maximum power transfer concept. What are your thoughts? I think it is a good idea if you want to use this equipment for study or experimental purposes. You also need to add several lines of code and change the display on the LCD. Where the Input filter Schematic sir? can I use this schematic without Input Filter? Oh yes, in my schematic diagram input filter is C5. It is useful to use it. can you send me your Arduino IDE code file…and proteus file as well…. I have been asked to check if the code goes to Proteus. Until then I did not check in Proteus. But it works and that’s what you can see in the picture in the text. For Arduino IDE code file please copy code from this page. Use hex file from C:\Users\Owner\AppData\Local\Temp\buildnnnnnnn6270374.tmp (for Windows). Use this one in Proteus. Do not forget to have two files .IDX and .LIB into Library folder for any used component. sir if i use inductor non toroid, does it matter for this schematic? Please use a toroidal coil that you find easily in a faulty personal computer source . It has the technical characteristics corresponding to the purpose. As I have previously answered, MBR1545CT, MBR1560CT is a Dual Common Cathode Schottky Rectifier. I connected pins 1 and 3 together. See image below. In schematic, ACS712 connected with A2, battery Voltage connected with A1. But in Code, you defined A2 is battery voltage, A1 is amps out of ACS712. Ouch! yes you right. I’m so sorry I just made a lot of changes in the schematic diagram and in my project, and an error has occurred. I think is the last. Thank you verry much for your atention. Thank you very much for the right observation. Follow the code that is correct and I’ll fix the error on diagram. I have solar panel : 25W – 20V and batterry: 12V -7.2A. when i connected with solar panel, ACS cannot read. it is not working. Can you help me to fix that? I will sent photo to your email. are you sure it’s not working? Each of them has different sensitivities, respectively 185, 100 or 66 (mVperAmp) Please see pdf. Do not forget one important thing: ACS 712 supplies a voltage to Arduino. At ZERO Amps at output is measured 2500 mV (ACSoffset). Please make a correction on the electric circuit: the ACS output is connected to the Arduino A1 pin. On the other hand, if there is no current indication, charger it may not work at all, because there is no battery charge current, indication ACS712 = 0 Amps. 15SQ045 is designed especialy as Solar Bypass Diodes, Polarity Protection, with 0.3 to 0.53 as forward voltage . If you do not have other diodes at your fingertips, I think you can use them too, for testing purposes. About 100uf/100v capacitor. In that kind of application you must use LOW ESR Capacitors. ( equivalent series resistance). If you remember , the capacitor equivalent circuit comprises four elements: capacitance, equivalent series inductance (ESL) – the sum of inductive elements including leads, a high-resistance DC path (Rp) in parallel with the capacitance, and equivalent series resistance (ESR) – the series resistive effects combined into a single element. ESR is frequency-dependent, temperature-dependent, and changes as components age. Nichicon, Panasonic, Rubycon or Vishay are the most famous brands in their manufacture. SOL_AMPS_SCALE =0.024506081. Is this scale for ACS712,30A? or ACS712,20A? or ACS712,5A? If this scale is for ACS712,30A, then what is scale for other two ACS? Please, tell me AMPS_SCALE of all ACS of 5A,20A and 30A. Thank you for asking me this question. 0.024506081 is scaling value for raw adc reading to get solar amps. ACS 712 Current Sensor 5A : 185mV/Amp. ACS 712 Current Sensor 20A : 100mV/Amp. ACS 712 Current Sensor 30A : 66mV/Amp. In calibration procedure of the current sensor AC712 to get the displayed value of 0.00A, the SOL_AMPS_SCALE value must be changed. This must be done individually for each ACS712 sensor using a regulated power source and a resistive load. (5/1024)*(R1+R2)/R2 => 0.027077415 But resistors value is not perfect !! These all are used in the calculations and are required to accurately display the voltage and must also be slightly changed by each one. is it not wrong sir, a led on D11,12,13, why is it given vcc at the end of the cathode? Yes, you perfectly right! All LED`s cathode are are connected to GND. I made the drawing in a hurry but that does not excuse the mistake. Thank you. I willl correct the diagram. sir what type of capacitor 1uf/25v , its elco or milar or ceramic ? Choosing the bootstrap capacitor is important for the good MOSFET operation. As the pdf. documentation says, bootstrap capacitor leakage current is relevant when using an electrolytic capacitor and can be ignored if other types of capacitors are used. It is strongly recommend using at least one low ESR ceramic capacitor (paralleling electrolytic and low ESR ceramic may result in an efficient solution). I used a Elco capacitor in tests but it is important to use a good capacitor and I recomand paralleling two 470nF 63V polyester film capacitors. Sir can I use this MPPT for 10 wp solar panel? if i use 10wp ,do I need to replace the component? An 10wp panel provides a small power at the output. A maximum voltage of 18V (21V open circuit) and a current of about 0.55A (0.67A – Short Circuit Current). Probably the 10 watt solar panel is fitted with a blocking diode to prevent reverse current drain and is supplied with a cable and connectors for battery maintenance, off grid lighting projects and use in caravans and boats, also provide power in isolated locations for telecommunications and telemetry applications. Documentation says that the 10W panel kit does not require a charge controller if the battery to be used is larger than 70Ah and in built diode protects against battery discharge. If you want to use a MPPT regulator with such a solar panel, the only components you can change are Q1 , Q2 MOSFET transistors and D6, using some of the lower power. Whatever the choice, please consult the datasheet first. Or if i use 20wp ,do I need to replace the component too? The link I gave you is not accidental. The 20-watt solar panel generates, of course, twice as much power as hight as 10W pannel, and this is achieved by changing the number of solar cells or their individual area. This means more output voltage and/or a lot of generated current. So you saw in the link that I gave you, a solar charger can handle a panel power between 1W and 100W. A solar charger can accept the input voltage between 8V and 28V and others go up to 100V and can provide charging batteries with a fixed voltage of 12V or 24V or adjustable up to 16,8V (in case of lithium battery). The idea is that the output power will always be very close to the input power. The electronic power components (MOSFET transistors and Schottky diodes) are the ones that have to withstand these powers and most of them realize this. Capacitors must be of high quality and with the LOW ESR feature. Sir can i use 100uH for inductor , if i still use 100uH for inductor what should i do for the coding? 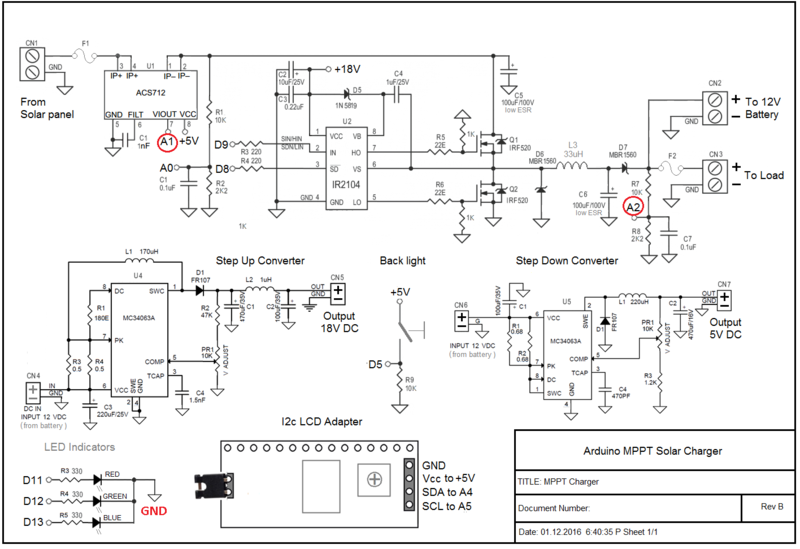 On the fly… the main module of MPPT Charger is BUCK converter. It has its component mosfet transistor coil, diode and capacitor. The switching frequency is inversely proportional to the magnitude of the inductor and capacitor. For a switching frequency of 50kHz (using dual slope the maximum frequency will be half. so that the maximum available PWM frequency on Timer 1 is 62.5kHz) at how much the converter is designed, the inductance value is 33uH. So its value is determined by mathematical calculations. A higher value of the inductance conduce to malfunctioning of the converter or to the removal of the parameters. If you already have the toroidal core, just reduce proportionally the number of turns and increase wire diameter. Hello sir, i have made the same project. 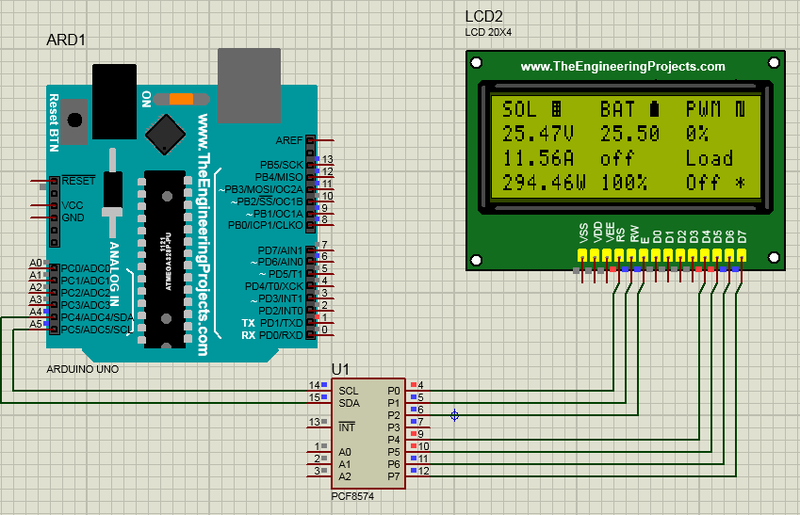 But i have a problem, amp Value of ACs712 to print in LCD , just has 0.02A , i used a solar panel 25W-19.1V. No one should forget to use the multimeter to make regular measurements of currents and voltages.